There are two main ways to design the back: reflective and reactive. In a reflective back, the only interaction is any reflection of the sound waves. These tend to be thicker, heavily braced backs. But in a reactive back, the thickness and bracing is designed to incorporate the back. If you hear a distinct difference when the back is dampened against your body, than when it is canted to remain free, then you better believe the back, and its wood choice, is having an effect. At first I thought - "What the heck - I can hear it." - but then - being scientifically curious - started to read it - it was quite interesting up to point where they were rating "sound quality" - hurraah - most guitars got good sound quality - but it was not separated or whatever the right word is - to good "this" or good "that" sound. There are so many good and pleasing sounds that radically differ from each other. At that reading point I grew tired of it and thought "BS" - if some of you read further and found something I missed - please tell me. Acornhouse : in this test we suppose that each guitar is held the same way - naturally we all know it makes BIG difference in sound how we hold it. squeeze it, hold our strumming/picking arm over the body, hover/rest palm on bridge etc. Last edited by Nuuska; 01-22-2019 at 08:55 PM. New concept to me, thank you! I always thought the primary function was to reflect, and the body wood characterized the frequency spectrum of the reflected sound waves. Where do you put archbacks? "Reactive", even though (I think) there's unquestionably a parabolic focusing effect? Mine (D25 and F65ce) are definitely muffled by body contact. The D40 seems less so; but your description seems to place it in the "reflective" category, or are you talking about mass of the back itself as opposed to actual shape? I'm still intrigued by the difference between archback and flatback sound to the point I actually prefer the D40 for some tasks now, and the BIG construction formula difference is the back, if one allows latitude for possible bracing and thickness of materials differences. But the D40 definitely produces the least distortion when recording. The way I always understood it was that the purpose was to prove that the top is responsible for the overwhelming percentage of sound quality, not that the back material was "irrelevant"
Right, I actually didn't read the "real" paper until after my first post. Interesting, yes, but I also question whether there was a hidden agenda on the part of the authors to "scientifically"justify the use of non-traditional tonewoods. The repetition of the premise that the "traditional" tonewoods are unsustainable is irrelevant to the hypothesis that body woods don't matter. CAN sonically satisfying instruments be made from non-traditional tonewoods? I think this was created simply to provide some ammunition to refute diehards who don't believe anything but the traditional woods will suffice. And does "negligible" difference mean NO difference? Last edited by adorshki; 01-22-2019 at 09:42 PM. It *always* was, mostly. But for an eccentric few, builders have heavily braced backs for decades, with so-called "ladder-braced" backs being ubiquitous to this very day. Rigid backs coupled to rigid sides act as sort of a prop hand to the star performer of the concert, the so-called "soundboard". Lightly braced active (or re-active, as Chris suggests) backs play a part akin to a guest star or supporting role. The next time you de-string your Guild, hold it by the neck up your ear and, using the side of your thumb or a knuckle, lightly rap the soundboard below the bridge, listening to the sound the wood makes. Rotate the guitar and repeat the tap test on the back (target the area(s) between the ladder braces). Note how much higher the pitch is. Active backs are typically tap-tuned to a harmonic of the soundboard, often ringing lower than the soundboard. As with the selection of your top wood, the selection of the back wood very much plays a role in the resultant sound of such a constructed guitar. Your archback back is more active than your ladder-braced back. At one time, I was considering sending a broken Ovation 12 sting back to Ovation for a rebuild. 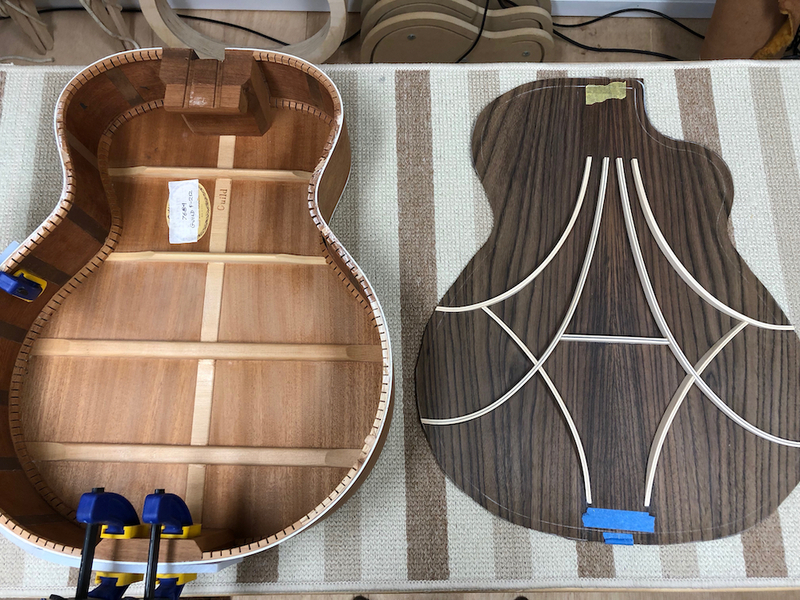 An Ovation guy who hangs out in AGF and of course, the Ovation Fan Club forum, was able to make custom wood choices, when he sent guitars back to the New Hartford shop and ended up with very nice guitars. So, I started looking around for sources of nice tops that would fit the bill and get the top built out of it. At one point, I contacted Kathy Wingert, her in California and asked some questions about wood and where to get it. After the disappointment of reading that all the GOOD wood was gobbled up by the long time customers before any hit the streets, ( She said that was a hard thing to get around ,when she started building guitars. All the good stuff was spoken for ! ) she said one thing that stuck with me. She thought Ovations were well build and sounded good, until you played them loud enough to hear the back. So, an Ovation has a back shape SPECIFICALLY designed to reflect the sound loudly and evenly. Since it's not wood, it doesn't really color the sound, but it DOES contribute to the sound, or Kathy wouldn't be able to hear it's contribution. I'll never be able to afford one of Kathy's guitars. It was awful nice that she took the time to email me back and forth.
. . . .. Since it's not wood, it doesn't really color the sound, but it DOES contribute to the sound, . . ..
What's the difference between coloring the sound and contributing to the sound. Certainly if you could replace Ovation's bowl with stainless steel - exactly same shape - or cast concrete - or any material - including wood - you would end with different sounding guitar. Good question. My guess is that "contributing to the sound" makes it louder. Coloring the sound changes the frequencies present and their relative amplitudes. An analogy to a "clean" amplifier probably works. Adjusting the volume "contributes" to the sound. Adjusting the tone controls (or equalizer) "colors" the sound. Thanks, will try to remember to try that. Your archback back is more active than your ladder-braced back..
Something I noticed about my D25 very early in the game was that if you simply speak close to the soundhole it catches the sound and begins to resonate with it, to the point that if I sing one of the string pitches the for a few seconds that string will actually start sounding. Never experienced that with any other guitar before that, I took it as a good sign. Coloring the sound changes the frequencies present and their relative amplitudes. An analogy to a "clean" amplifier probably works. Adjusting the volume "contributes" to the sound. Adjusting the tone controls (or equalizer) "colors" the sound. That's what I mean when by "coloring": the way a given body wood changes the waveform(s) it's reflecting, it's what allows us to distinguish maple from mahogany. Or why your Starfire bass can yield certain sounds your Jetstar can't, and vice versa. "Close", maybe, but always that "something" that you know you only get from one or the other of 'em. And in this case maybe not even due to the body woods as much as the actual difference in construction, hollow-body vs solid body. Or how about the ever-popular " What strings" question: nobody ever disputes that strings color the sound. Probably even more than the body wood in most cases. Unless the strings on the guitars in the subject experiment were D'Addario EJ-16's, the whole thing's worthless, they didn't use the right strings. Last edited by adorshki; 01-23-2019 at 05:12 PM.